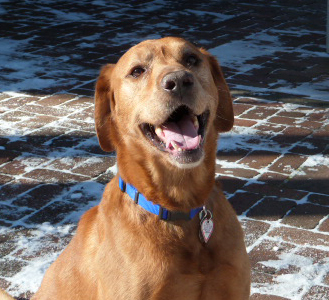 Gabe is a super-friendly fox red Lab who’s a whiz at food puzzles! He’s an energetic and playful seven-ish years old who weighs about 60 pounds. Gabe came to us as a neglected stray who is quite the happy, handsome character now! Gabe’s foster dad, who is also our dog trainer, notes he’s a most engaging, good-natured house guest who loves playing with and hanging out with the other dogs in his home. He’s house trained, crate trained, knows sit, rides well in the car and is pretty good on the leash. Gabe loves having company over and can be an exuberant greeter; you might also find him nibbling on your coat tails if you turn your back! Faves include long walks with lots of sniffing, eating, and playing with other dogs . . . and maybe an occasional bout of the “zoomies.” He has not met any cats while with us. Our boy may be seven-ish, but he is no couch potato and relishes his daily exercise – long walks, hikes, the dog park, playing with dog buddies at home are all activities that will get his tail wagging! He is super food motivated and will help himself to other dogs’ dinner; he needs to be fed separately from other canine housemates as they may not take kindly to an intruder at their dish. 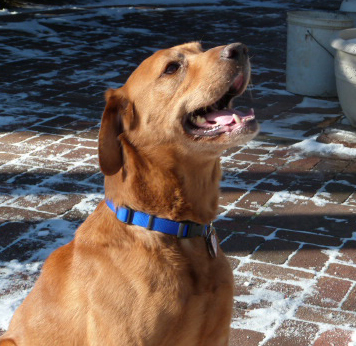 Gabe has thrived with the structure, positive-oriented training and kind leadership provided by his foster dad. These all need to be continued in his forever home. Playful, active, affectionate and just a little silly, Gabe would love to find you at the other end of his leash very soon!